My cousin Sara got married last weekend. It was a great wedding and we are so happy for Sara and Colby. I had the privilege to help out with the decor for the wedding. 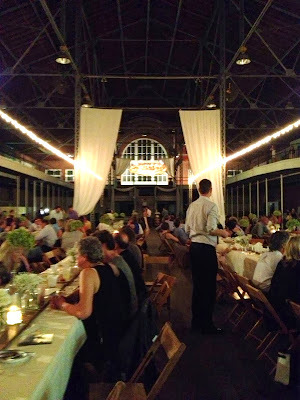 Colby worked at the Iowa State Fair grounds so he was able to rent the Agriculture building that is one of the biggest and oldest buildings on the grounds. Then I thought I should show this to Kim and Sara before I get too involved. Boy was I ever nervous! I think as an artist I struggle with doubt even though I was completely confident in my design, I just didn't want to put myself out there. And this is family why would I be nervous?! Again I think it was the mother daughter thing. I am a believer in nerves, I think they are healthy and good whenever you use your gift or talent, in some way that gave me confidence that I was on to something good..... and really I believe this idea was given to me as a gift, it wasn't just me saying look at what I did! I believe it was something I had to share! This keeps me grounded. So when Kim and Sara was happy with the design I was relieved, 1st of all that I didn't step on toes and that I got to see this vision played out / birthed! When I 1st saw this building a fell in love with the wood ceilings and the beams. I thought how manly and industrial. But I wanted to bring it down, make this open room intimate/romantic and it needed a feminine touch, it needed Sara. So like I said everything had to be big.....so we made a 6 foot chandelier! With hundreds and hundreds of flowers! We started building the bones of the chandelier with PVC pipe. I wanted this thing to be as light as we could make it. I think there is a side of me that wasn't always there before, the logical side of my brain. I had these big ideas but how in reality do you make this happen. Through this whole process I went through a lot of thinking and figuring from the chandelier to the drapes, .....but I wont' go into it, since it is a bit boring.....but tapping into that side of my brain has grown me as an artist and a person. Then we added grape vine. We found grapevine in peoples yards. Then we added fencing for the flowers to go in. The bones of the piece reminded me of a float you might see at a parade. They started out white and then we dipped them in coffee,tea and pink water. It was a family affair and my dad thought he would twirl the flowers with a drill, but by hand worked the best! Here is our bride at work. This was the last of the Vanderpool girls to get married. We were all so excited and it was such a celebration! 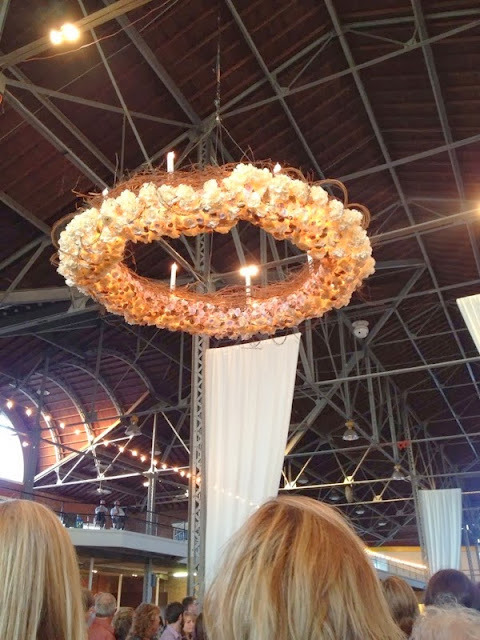 We made sections of flowers and then attached it to the chandelier/ wreath. then it was time to put that baby up....it took 2 lifts. I love how classy the chandelier looked it gave it a Kentucky Derby feel! then we started draping fabric. It was like frosting a cake. I had my drawing in hand. Even with my plan I doubted....but it started to look just like the drawing and I was amazed. It was a gift to see it come together! It was starting to come together and have that warm feel.....the drapes did it! Here's a picture at the dress rehearsal.......my baby in the middle. The room felt so warm and intimate yet cathedral like! Sara designed the tables. They collected bottles all summer and got boards to go as runners. She had several long tables for people to sit and have dinner. Sara and Colby with there flower children.....William and Fish on the right hand side. My sister holding this sweet girl! I didn't get a picture of Sara and Colby together.....but it was a beautiful day. I can't think of a better place for them to get married it was so them! The building was rustic and strong like Colby that needed a touch of Sara to make it a home! Congrats to the both of you!